I wonder if they knew. the way he wouldn’t dare to now. the way she can’t anymore. or embraced the beautiful sting of an ignited spark? 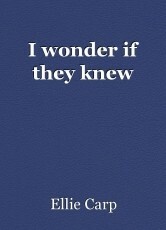 I wonder if they knew then. knowing that her hands would tingle now with only the taste of remembrance. anticipating the sore that would sit in his muscles today. or held on even tighter? and her eyes wandered with excruciating vulnerability. or would she have rushed the words out of her lips? or would their words have intertwined simultaneously? and her eyes, bled from fear and hurt. or would he have let her heart go? and spilled the tales of pain and betrayal. or would she have let them fall? securing her, showering her, showing her the authenticity of adoration. and they were simply themselves. denying themselves of each other? allowing the soundlessness barricade the two. and his words of consolation just grew too short. or would the stillness split as they walked away? They must have known then. When his greeting was damaged in dread and desires dead. and their lips bleeding with teeth marks. When the comfort between these two strangers grew uneasy. and her silence, for the last time, killed him. or would they have never? This page was created in 0.5409 seconds.